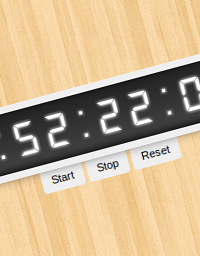 Learn to make a stopwatch in CSS3. This tutorial focuses on step based CSS3 keyframe animation, along with the usage of the animation-play-state property to start/stop/reset the stopwatch. The animation-play-state property may be removed because it can be replicated using other methods and is currently not supported in all browsers, but the idea behind the functionality of the stopwatch is worth learning. The only image used is the background wood pattern(just for beautification purpose). The JS used is prefixfree - just to make the length and size of the tutorial short and easy. No images or JS are used in the stopwatch logic/display. The code can be modified and enhanced to be used as timers, countdowns, counters, etc. It does use one JS file. Cool otherwise. really cool and intelligent – both the coding and the walkthrough feature. i like! Very intelligent and cool watch. Well I playing with it to start and quick stop and I could manage to stop the clock at 00:00:00:171. Can anyone beat that? Would like to see this as a countdown timer, but that would need to knowing (a) the date and time “now” (b) the destination date/time. Can CSS3 handle this? every new post shock me. awesome. The problem for me is the technology boundaries are now becoming blurred somewhat. Also when technology boundaries do become blurred the technologies individually become bloated also. Nice effect I know but at what cost? Very cool and good looking. How can we publish the work on theCodePlayer? is it not opend to every one. Cool.. but I tried this on IE, it does not work yet.. Superb, but it uses a JS file. Thanks for sharing this nice post !! Yes it used a single js file, but if you saw what the file is, you’ll realize that it has nothing to do with functionality. how can you use window.onload command to start the cloack automatically? could you give me the code? This is totally awesome. However, using the code I can’t get it to work. Can’t you do this with CSS counters (counter-increment and counter reset) or use the content property, to make it “full css” (except the HTML skeletton of course) ? I may be wrong, don’t hesitate to correct me. @Shane That’s prefix free… That just takes care of prefixes. So, no. No real JS. Would there be way to start, stop and reset using js code? Super! On a whim I wanted to put a stopwatch timer on a wordpress blog, and realized I didn’t hove the slightest clue how. Granted there’s a bunch of countdown generators, but I actually to count up and I didn’t want a plugin wither. Now I know how..
Dude! This is awesome! How do you think of these things???? Amazing inspiration i think!.. Thanks for share this tutorial. I will use same technique for my popup..
jsut played around with clock and got 00:00:00:169. How to write any time you want to start???? any idea, thanks for your help. Countdown Timer Clocks eff ever been an provocative countdown-timer.net break of any event. Numeration backwards to see how overmuch abstraction is remaining before an event increases the anxiousness of the prospect. It would be high if you had the opportunity to create your rattling own Plug In Countdown Timer. a widget you could bask the Countdown Timer Music on your protect. I have been reading out some of your articles and i ought to say good stuff. I will surely bookmark your blog. Hi there, just became aware of your blog by means of Google, and located that it’s truly informative. I’ll be grateful should you continue this in future. Lots of people will benefit from your writing. Cheers!